Wigan have signed Everton's Republic of Ireland winger Kevin Kilbane on a three-year deal with an option for a further year. BBC Sport understands the fee for the 29-year-old is in the region of £2m. "I am delighted Kevin has agreed to come on board. He's another real quality acquisition for us," Jewell told the club website. "He brings something we haven't got at the club, a naturally attacking left-footed player." 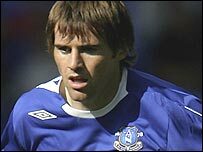 Kilbane added: "Paul Jewell is my type of manager because he likes to be close to players and I just want to join up with the rest of the squad and playing my part." "I'd like to say a big thank you to everyone at Everton. I've had great support from everyone there and there's always a bit of you that's sad to say goodbye when you leave such a great club."